Tokyo (AFP) – The Japanese town made infamous by the Oscar-winning documentary “The Cove” will open a marine park where visitors can swim with dolphins, but its annual slaughter of the creatures will continue in a nearby bay, an official said Monday. But, the government official insisted, far from having caved in to pressure from conservationists who want an end to an annual hunt that turns waters red with blood, the project was aimed at helping to sustain the practice. “In summer swimmers can enjoy watching the mammals that are released from a partitioned-off space. “But we plan to do it on a larger scale. This is part of Taiji’s long-term plan of making the whole town a park, where you can enjoy watching marine mammals while tasting various marine products, including whale and dolphin meat,” he said. The park will be separate from Hatakejiri Bay, the place into which the fishermen of Taiji corral dolphins, select a few dozen for sale to aquariums and marine parks, and stab the rest to death for meat. The plan calls for the creation of a whale safari park stretching roughly 28 hectares (69 acres) by putting up a net at the entrance to Moriura Bay in northwestern Taiji, the official said. The 2009 film “The Cove” brought Taiji to worldwide attention, winning an Oscar the following year, after graphically showing the killing, including by using underwater cameras. Activists continue to visit the town to protest the hunt. Taiji, in western Wakayama prefecture, is looking to open part of the park within five years, Wada said. Black whales and bottlenose dolphins caught in waters near the town would be released into the are, which would be developed as a nature park that also includes beaches and mudflats, he said. Wakayama prefecture said the town caught 1,277 dolphins in 2012 and has licence to capture 2,026 this season, which began in September and runs until August next year. Tokyo-based conservationist group Iruka & Kujira (Dolphin & Whale) Action Network (IKAN) said the plan was “unfortunate” for the town. “The whole plan is based on the concept that they can exploit dolphins and whales freely as their resource, but the mammals don’t belong to Taiji,” said Nanami Kurasawa, the IKAN secretary general. “Marine mammals migrate across oceans, and internationally public opinion is that wildlife should be allowed to live as they are. 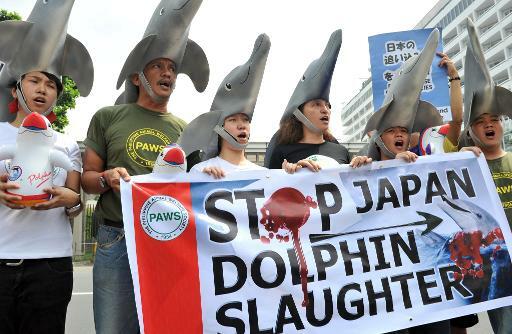 The plan will only ignite more protests over dolphin-hunting,” she said. People in Taiji argue that dolphin-hunting is part of a 400-year-old whaling and culinary tradition. They charge that campaigns against it are cultural imperialism that neglects the parallels between killing dolphins and killing cattle. But Kurasawa said demand for dolphin meat is dwindling and only 100 people of the 3,400 population are engaged in dolphin hunting-related businesses. “If they want to get more tourists, they can for example exhibit the beautiful whale-hunting ships used in ancient days, that would show their tradition without stirring more controversy,” she said.